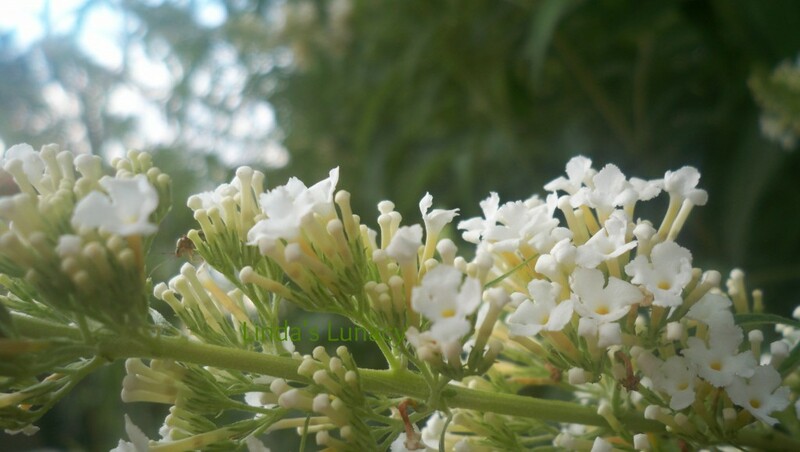 The Butterfly Bush is a large shrub that is easily grown and blooms from mid-summer to fall. They grow best in full sun, and can be grown in Zones 5 and above. They don’t usually fair very well in colder climates. I’ve had two for several years now, and the only regular maintenance is pruning in the fall. And that pruning isn’t absolutely necessary. The flowers are produced on new wood. If you don’t prune, the bush will get very large. We prune ours back in the fall, and they still end up over 15 feet by the end of the next summer. 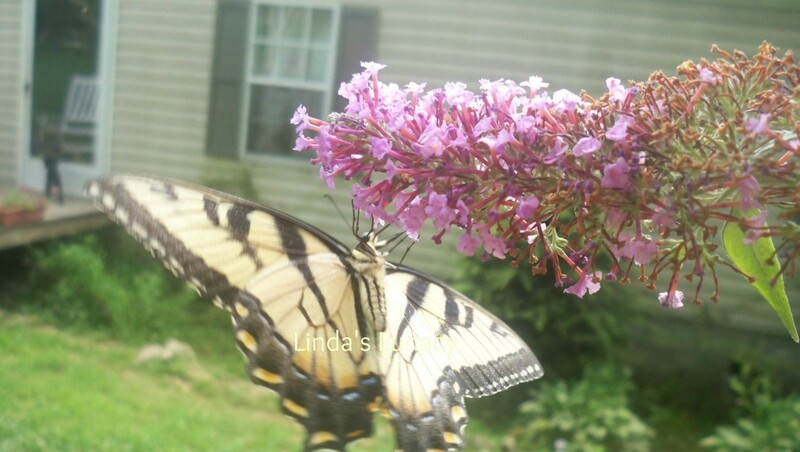 I always thought that the Butterfly Bush and Lilacs were in the same family. Turns out, they are not. They have similar little flowers, though. 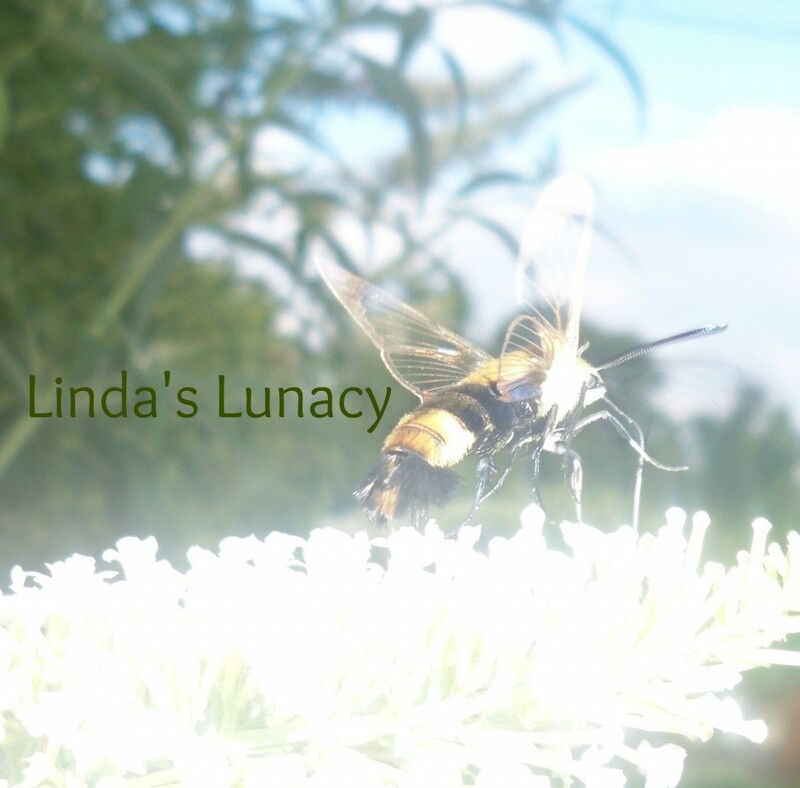 The Butterfly Bush does not have as much scent as Lilacs do. Butterflies, moths, bees, all kinds of flies, and hummingbirds are regular visitors to our Butterfly Bushes. It is so relaxing and such a joy to sit and watch the butterflies. They fly from flower to flower and from bush to bush. We’ve even seen many Butterfly fights. Yes, they fight and chase each other. One never thinks of Butterflies being aggressive in that manner, but they are. Here’s a butterfly hanging upside down on our purple Butterfly Bush. Then the Butterflyy cooperated by righting itself for another picture. It’s an Eastern Tiger Swallowtail. And very beautiful. We have several different varieties of butterflies that visit our bushes, but I haven’t identified all of them yet. Of all the other creatures that visit the butterfly bush, this one is the scariest looking. It’s a large brown and yellow bee/wasp looking thing. I haven’t been able to identify it yet. I took a couple of pictures of it today. This picture is really bad, except for the wings. I cropped the picture, and added my name, but other than that, the picture is unedited. In all the other pictures I took, the wings are just a blurry spot, as the are always moving. This must be a picture miracle, as I have no idea how I got it. I am fascinated by the wings, though. For some reason, when I took this picture, the flash went off. The creature didn’t like it at all. It started chasing me! I screamed and ran, and it finally left me alone. lol Apparently it didn’t like it’s picture taken. Or it really liked the red shirt I was wearing. lol Either way, I will be much more careful if I ever take it’s picture again! If you want to identify butterflies and moths, Butterflies & Moths of North America is a great site with lots of images. You can find Butterfly Bushes are most nursery & garden centers. Or in gardening catalogs. 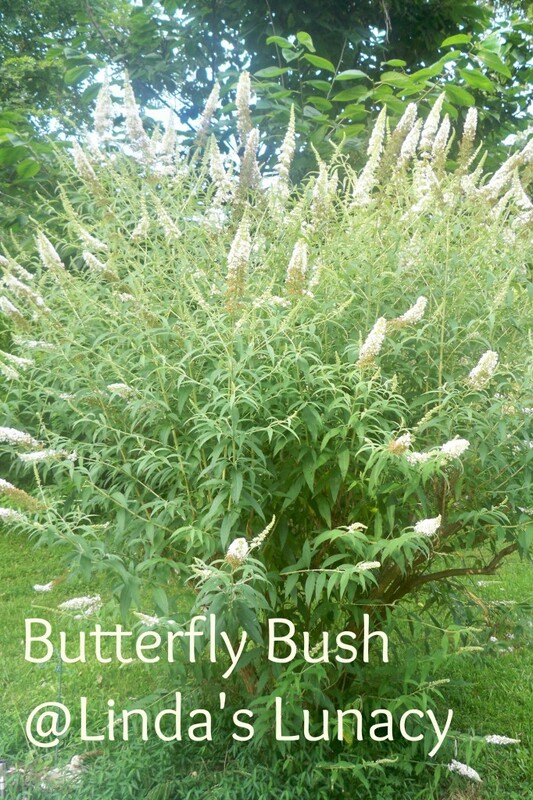 You can even buy Butterfly Bush on Amazon! (affiliate link) I found out you can even buy seeds to start your own Butterfly Bush! *Disclosure: The Amazon link above is an affiliate link. If you click the link and purchase something, I will receive a commission. That’s a hummingbird moth, they are harmless! 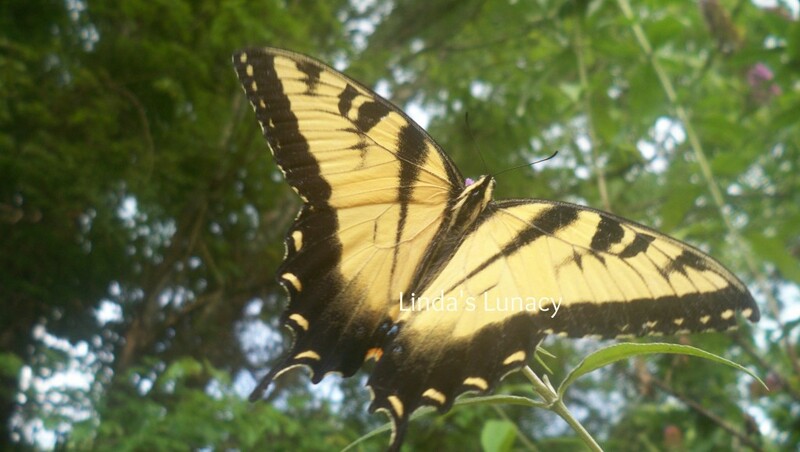 Should have added the photos of the Swallowtail are lovely, thanks for sharing them. We plant swan plants to attract Monarch butterflys where we live. They go through their life cyle on the plant and it is lovely to see them hatch from a crysalis.